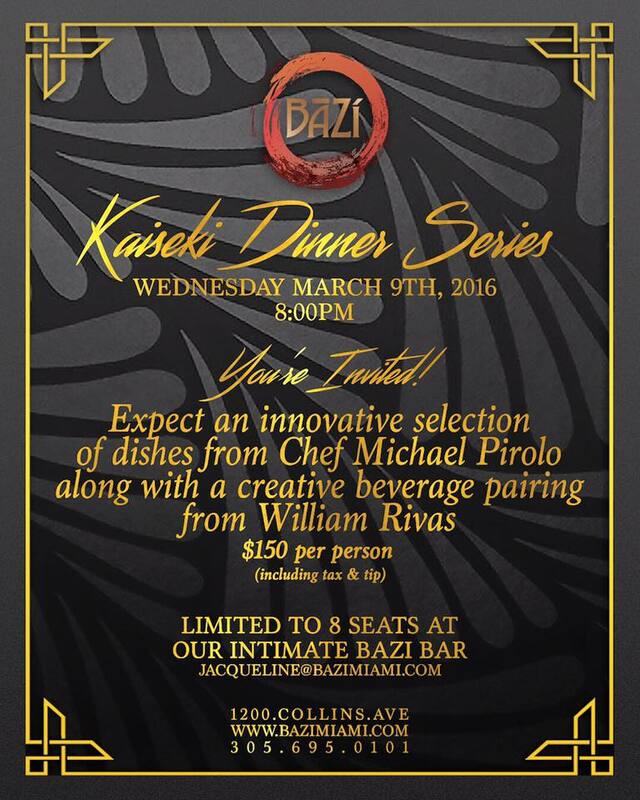 Bazi is introducing an exclusive monthly Kaiseki dinner with the first one being hosted Wednesday, March 9, 2016 at 8PM. Kaiseki traditionally consists of a sequence of small, artistically arranged dishes that foster a harmonious balance between taste, texture, and aesthetic. This one-of-a-kind experience will feature 10-12 courses designed and orchestrated by Michael Pirolo, and will showcase seasonal ingredients from the decadent to the exotic. Dishes prepared Kaiseki-style are done so in a way that aims to enhance their flavor and energy. Every course will be paired with unique libations ranging from sake to Asian teas courtesy of Bazi’s Beverage Director, William Rivas. Hosted monthly at the restaurant’s downstairs bar, an intimate setting limited to eight seats. Priced at $150 (including tax and tip), each Kaiseki dinner promises to be different from the one before, providing a rare curated experience.